Women are looking for answers. They want to know they have the same rights as the men standing next to them do. They want to know when they march, they’re being heard. They want to know someone is for them. Essentially, they’re asking: Do I have value? Does my voice matter? Does anyone care? And yet in all of it, I wonder if they’re getting answers to their questions. Alsup—author, women’s Bible study writer, and community college teacher—gives a thorough and helpful synopsis of creation and the fall, along with Eve’s role in it. In doing so she helps us grasp God’s vision for women from the beginning. She underscores the fact that “personhood preceded womanhood”—that is, God created humanity first and then differentiated between male and female. By doing this at the outset, Alsup challenges those with preconceived notions about how God views women. Alsup ultimately shows a woman’s purpose is equally significant to a man’s in the eternal purpose of God. Multnomah (2017). 224 pages. $15.99. Alsup also explains the consequences of the fall and how it distorts our understanding. We can’t fully understand why things are the way they are if we don’t understand how we got here. I appreciate the ways Alsup painstakingly recognizes the mental and emotional struggle some women experience when they read the Bible. After copious research and consideration, she concludes God’s curse on man and woman in Genesis 3:16 boils down to this: “Man’s root problem from the fall leads to a frustrated idolatry of work, while the woman’s lead to a frustrated idolatry of man” (66). She provides substantial evidence of this pattern throughout countries and cultures. Yet, she also reminds us, the fall isn’t the end of the story. Christ came to free us from the curse, and we should make his redemption the highlight of our story. 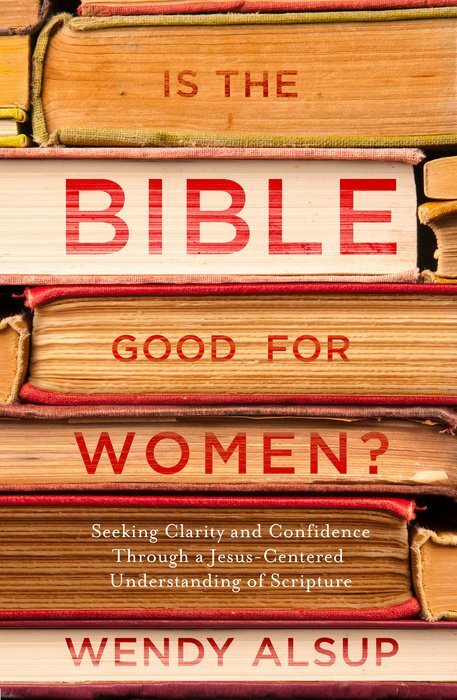 Alsup takes her time before answering the question of her book: Is the Bible good for women? When she finally gets to it, though, she jumps right in. With “the Bible is the best commentary on itself” as her mantra, she emphasizes the importance of either accepting Scripture wholly for what it is or throwing it out altogether. There’s no picking and choosing when it comes to God’s Word. We can all recognize there are some deeply troubling stories in it concerning women. Alsup does a fabulous job explaining the original context and historical background (including details we might not grasp as modern-day readers), and offering helpful personal commentary. Addressing the stories of Hagar and Sarah, Ruth, Dinah, various Old Testament laws, and Paul and Peter’s instructions to women, Alsup gives us tools to use when assessing these difficult passages. She also explains the differences between “descriptive” and “prescriptive” texts to help us rightly understand what we read. There were a couple of times in the book that Alsup made a statement to the effect of: “The application for you in your denomination or church may be different.” While I wish she would’ve been clearer on the ways various interpretations play out in different situations, she does a good job of being gracious and not drawing a line in the sand where unneeded. Is the Bible Good for Women? doesn’t just equip women to interpret Scripture correctly; it helps us gain a right understanding of a woman’s value. God made all of humanity in his image, and his ultimate purpose for his creation is to live in a world where both man and woman are mutually responsible to each other and their Creator. Crafted in the divine image, women find strength and dignity—God hears them and is for them. For this reason, Alsup claims a better view of women not built on Western values and views, but on God’s goodness and justice. She points us to Christ’s redemption, where men and women alike find ultimate value. At the cross, the answer to our questions is yes. Yes, women have value. Yes, their voice is needed. Yes, Someone cares. Jenni Pyrch (MDiv, Reformed Theological Seminary) is a wife and mom who is passionate about helping women grow in their relationship with Christ and their community around them. She helps facilitate women’s ministry at her church. She and her husband are currently stationed in Colorado Springs, Colorado, with their two children and two dogs, where they are members of Westside Church (PCA).